We’ve been noticing the trend of statement jewellery crafted in ‘ Afghan’ – style designs for over two years now that even today continues to be quite popular. Be it in new, vintage or museum quality design and finish – one makes a statement when wearing Afghan – style jewellery. From the by- lanes of Kabul in Afghanistan – a few intrepid folk have been hand-picking their jewellery which is still as old and beautiful as it used to be since the past 3000 odd years. Afghani women wear a lot of traditional ornaments such as head-pieces, earrings, necklaces, anklets, waist belts and more. There are no local sources of silver or gold in Afghanistan, so much of the jewellery is set in alloys made by melting down old coins. In addition to semi-precious stones, pieces are crafted using glass, enamel, old coins, and plastic and stone beading – everything has a decorative value, regardless of its origin. Afghanistan is also famous for its lapis lazuli work (one of only two countries in the world with lapis mines). 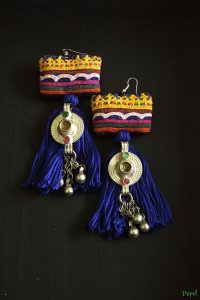 Their jewellery also features elements such as hand painted motifs, enamel work, cutwork and other exquisite tribal elements which are also strung onto vibrant cotton threads. The origin of this style of jewellery is believed to be in the craft of the Kuchi tribe. The Kuchi were a nomadic group of traders- living the life of gypsies throughout Central. Asia. Afghani Kuchi Jewellery has been exuberant, joyful, and eclectic. Their festive pieces were filled with colour and sound, with dangling charms and bells creating music. It is easy to confuse the Kuchi tribe with the people of Kutch (Kachchh) in western India. True, there are many such similarities between Kuchi and Kutch jewelry styles, but similarities are common throughout Central Asia and India. Nevertheless, there could well have been some mingling between the two groups, since the Kuchi were prolific wanderers who migrated over immense distances. Afghani Kuchi Jewellery was crafted in many different forms. Headpieces were worn spanning the forehead, with danglers and small pendants hanging from the bottom edge to frame the face. Large jangling earrings, nose rings, hair ornaments, necklaces, amulets, coins, beaded fringes…just about any colorful and bold piece of jewellery could be worn around the neck. On any given day, a headpiece might also double as a necklace, and vice versa. Ornate bracelets adorned both the upper and lower arms. Many were long, extending high up the arm, from the wrist. Rings, on all fingers, were sometimes attached by chains to a bracelet cuff. Jewellery Belts were used during celebrations. Tinkling anklets were a beloved accessory. They were such a popular item, that even the camels wore them, and brought the desert alive with the sounds of their steps..
Afghni Kuchi Jewellery is a favorite of belly dancers, and anyone wanting to make a tribal statement. Not only is it just fun to wear, but the very act of putting it on seems to transport one to a different time and place. The weight of it, the sparkle of it, and the sound of it can conjure up pleasing images of a confident Kuchi woman heading into a village or town for all to see. A lot of the stuff one sees is vintage and imported – but our resourceful designers and craftspersons have also begun crafting Afghan-style jewellery skill-fully adapting their techniques and giving traditional designs a contemporary twist. We’re looking forward to showcasing our selection of statement Afghan style jewellery as a part of our art jewellery section here. Enjoy bringing the tradition alive with us !